Staphylococcus aureus is a versatile pathogen which can cause various mild to life-threatening infectious diseases. The evolution of S. aureus resistance is notorious, from penicillin and oxacillin to vancomycin. Vancomycin, introduced in 1956, was once considered a most reliable antibiotic for methicillin-resistant S. aureus (MRSA); unfortunately, the first strain of S. aureus with decreased susceptibility to vancomycin emerged in 1996. Vancomycin has been approved in Taiwan since 1983, and the prevalence rates of heteroresistant vancomycin-intermediate S. aureus (hVISA) and vancomycin-intermediate S. aureus (VISA) in 2003 were 0.7% and 0.2%, respectively. However, a ten-fold increase of hVISA and VISA to 10% and 2.7%, respectively, in 2012–2013 could indicate a challenging clinical situation in Taiwan. The most commonly reported staphylococcal cassette chromosome mec (SCCmec) types of hVISA and VISA are usually SCCmec type III or II, typical nosocomial MRSA strains. Preventing the spread of resistant pathogens through infection control interventions and judicious antibiotic stewardship is a serious medical issue. Staphylococcus aureus is a versatile facultative anaerobic, nonspore-forming, high environmental-resistant, Gram-positive coccus, with the ability to grow on mannitol salt agar which inhibits many organisms because of its high 7.5% salt concentration. The differentiation between S. aureus and other staphylococci species depends on positive coagulase and clumping factors . Before the 1880s, Ogston described clinical diseases such as sepsis and abscesses resulting from S. aureus. Nowadays, S. aureus remains one of the most important clinical pathogens. It causes many diseases, including superficial skin and soft-tissue infections, food poisoning, and various invasive diseases, such as endocarditis, osteomyelitis, pneumonia, meningitis, and even septic shock and death . According to the Taiwan Nosocomial Infections Surveillance System, S. aureus was always one of the top ten causative pathogens of nosocomial infections in intensive care units in medical centers between 2006 and 2015. The percentage of methicillin-resistant Staphylococcus aureus (MRSA) among all S. aureus strains ranges from 66.9% to 84.5% . In addition to being one of the most important clinical pathogens, the resistance or decreased susceptibility to various antimicrobial agents (from penicillin to methicillin and even vancomycin or antiseptics) of S. aureus presents troublesome clinical problems ,. Due to increasing antibiotic resistance, it is essential to prevent the spread of these resistant pathogens or genetic determinants using infection control interventions and antimicrobial stewardship. Penicillin – discovered by Alexander Fleming in 1928 – radically changed the relationship between humans and microorganisms after its mass production and clinical prescription in the 1940s . Thereafter, effective, inexpensive antimicrobial agents with limited side effects were available for various bacterial infectious diseases. However, resistance to various antimicrobial agents in clinical isolates developed under evolutionary selected pressure in the current antibiotics era. The development and spread of resistant S. aureus strains directly resulted from frequent clinical overprescription of antibiotics . S. aureus rapidly developed penicillin resistance after the introduction of this drug into clinical use, with penicillin-resistant S. aureus strains emerging within 1–2 years, followed by 25% resistance of S. aureus strains in hospitals after 6 years and 25% resistance of S. aureus strains in communities after 15–20 years. Currently, <3% of clinical S. aureu s isolates are susceptible to penicillin . The penicillin resistance came from blaZ, a plasmid-carried gene, which has propagated rapidly among bacteria populations . S. aureu s-carrying blaZ is resistant to penicillin, ampicillin, amoxicillin, ticarcillin, and piperacillin, which are all labile to penicillinase. These blaZ-carrying penicillin-resistant S. aureus strains are still susceptible to penicillinase-stable penicillins such as oxacillin, methicillin, cloxacillin, dicloxacillin, and nafcillin; β-lactam/β-lactamase inhibitor combinations such as amoxicillin-clavulanate, ampicillin-sulbactam, and piperacillin-tazobactam; carbapenems, including doripenem, ertapenem, imipenem, and meropenem; and most cephalosporins . Methicillin was first introduced into clinical usage in 1961, but the first MRSA strain emerged within 1 year. Twenty-five percent of intrahospital S. aureus strains were methicillin-resistant 25–30 years after the introduction of methicillin . The resistance mechanisms of MRSA originate from the mecA gene in staphylococcal cassette chromosome mec (SCCmec), a mobile genetic element, which would lead to the production of penicillin-binding protein 2a which cannot bind with most β-lactam antibiotics . That means with the exception of some new anti-MRSA cephalosporins such as ceftaroline and ceftobiprole, MRSA strains are resistant to all other β-lactam antimicrobial agents . Eleven different SCCmec types have been reported, and all contain the mecA gene, except for SCCmec type XI strains which harbor the mecC gene, also known as mecALGA251 ,,. Before 1996, MRSA was always considered a typical nosocomial pathogen, harboring SCCmec type II or type III (around 34–67 kb) . Even today, MRSA strains with SCCmec type II or III are still considered typical nosocomial pathogens worldwide, including in Taiwan ,,. After 1996, MRSA strains with the smaller SCCmec (type IV or V, around 20–27 kb) emerged in the community; these MRSA strains harbor fewer non-β-lactam-resistant genes and might be susceptible to macrolides, tetracyclines, fluoroquinolones, lincosamides, and folate pathway inhibitors ,,. Now, nosocomial infections can result from these MRSA strains that were once thought to be limited to the community ,. Vancomycin was introduced in 1956 because of emerging penicillinase-producing S. aureus ,. There was a temporary reduction of vancomycin in clinical use because of the introduction of methicillin, a penicillinase-stable penicillin, in 1961. As new MRSA strains emerged and the number of β-lactam-allergic patients increased, vancomycin use increased gradually after the 1970s . Unlike the strains which rapidly developed resistance to penicillin and methicillin, the first S. aureus with decreased susceptibility to vancomycin was reported in 1996, 40 years after introduction of this drug . This difference might result from different resistance mechanisms between vancomycin and β-lactams. The genetic determinants of β-lactam resistance are usually transmitted through plasmids or as a mobile genetic element and could propagate rapidly between bacteria. With growing prescription of vancomycin, the vancomycin minimal inhibitory concentration (MIC) of clinical S. aureus isolates has gradually elevated , which might result in more vancomycin treatment failures ,,. The Clinical and Laboratory Standards Institute (CLSI) lowered the clinical susceptible MIC breakpoint from ≤4 μg/mL to ≤2 μg/mL to increase clinical applications in 2006 . According to the current CLSI suggestions, S. aureus with reduced susceptibility to vancomycin could be categorized into vancomycin-resistant S. aureus (VRSA) with a vancomycin MIC ≥16 μg/mL; vancomycin-intermediate S. aureus (VISA) with a vancomycin MIC of 4–8 μg/mL; and heteroresistant VISA (hVISA) with a vancomycin MIC of 1–2 μg/mL [Table 1] . Despite lowering these interpretation breakpoints to ensure compatibility with clinical treatment responses, there were still troublesome issues because of the existence of hVISA and the inability of routine clinical antimicrobial susceptibility testing to detect VISA precisely. Since 2009, the vancomycin susceptibility of S. aureus cannot be determined by the disk diffusion method because it fails to differentiate vancomycin-susceptible S. aureus (VSSA, MIC ≤2 μg/mL) isolates from VISA (MIC 4–8 μg/mL) and VRSA (MIC ≥16 μg/mL) strains . Because time-consuming and labor-intensive standard dilution methods (microdilution, macrodilution, and agar dilution) are not applicable for routine mass clinical use, automated platforms such as the BD Phoenix™ automated testing system, the VITEK ® 2 automated instrument, and the MicroScan system are used in clinical laboratories in Taiwan. However, there are still inconsistencies between standard dilution methods and these FDA-approved testing systems ,. Vancomycin screening agar, which contains vancomycin 6 μg/mL and is usually used to detect vancomycin-resistant enterococci (VRE), is one of the methods suggested by the CLSI to detect vancomycin resistance in S. aureus, but it could miss VISA isolates with a vancomycin MIC of 4–6 μg/mL . The resistance mechanisms of VRSA originated from S. aureus isolates gaining the vancomycin-resistant determinant vanA from VRE ,. However, the genetic determinants of VISA and hVISA are still controversial but are usually related to mutations in cell wall building genes ,,,. The only consistent feature of these low-level vancomycin-resistant isolates is cell wall thickening, and there is a positive correlation between cell wall thickness and vancomycin MIC levels ,. This thickening locks many vancomycin molecules in the bacterial cell wall, which results in less vancomycin diffusion from outside into the division septum, and vancomycin tolerance develops . Currently approved methods or automated systems are reliable in the detection of VRSA and VISA among clinical isolates but not for discovery of hVISA, which harbors a few vancomycin MIC >2 μg/mL subpopulations (in < 1 × 10-6/mL concentration), although the MIC of hVISA is still within the susceptible range . This extremely low concentration of resistant subpopulations cannot be detected by regular standard dilution methods because the bacterial amounts or concentrations used in microdilution, macrodilution, and agar dilution are about 5 × 104 colony-forming units (CFU)/well or 5 × 105 CFU/mL, 5 × 105 CFU/mL, and 1 × 104 CFU/spot, respectively . More than half of S. aureus isolates with a vancomycin MIC of 2–3 μg/mL and 10%–20% of S. aureus with a vancomycin MIC of 1.5 μg/mL are hVISA . The reported epidemiology of hVISA varies significantly, from 0% to more than 30%, because of different time periods, different regions, and different screening methods ,. No approved method has been developed to detect of hVISA, and most reported procedures rely on elevated test bacteria concentrations or prolonged incubation periods . The population analysis profile is considered the most reliable detection method for hVISA, but it is time-consuming and labor-intensive and is not practical in clinical laboratories . In patients receiving vancomycin treatment, higher failure rates, longer inhospital stays, and prolonged bacteremia periods have been reported in those with hVISA infections than those with VSSA ,. Vancomycin was approved in Taiwan in 1983 . In 2003, the prevalence rates of VISA and hVISA in Taiwan were 0.2% and 0.7%, respectively, based on MRSA isolates from ten medical centers . A report from one hospital in southern Taiwan in 2009 showed that there were five cases of hVISA (8.1%) in 62 blood MRSA isolates . Another study in 15 hospitals from 2012 to 2013 revealed that the prevalence rates of VISA and hVISA in Taiwan had increased to 2.7% and 10%, respectively, based on 622 MRSA isolates with a vancomycin MIC ≥1 μg/mL . The most reported SCCmec types of hVISA and VISA were usually SCCmec type III or II, typical nosocomial MRSA strains ,. The ten-fold rise in the prevalence of VISA and hVISA over 10 years indicates rigorous, inevitable clinical challenges for infection control and treatment. According to the practice guidelines of the Infectious Diseases Society of America and Infectious Diseases Society of Taiwan ,, not all MRSA infections should be treated with antibiotics. Incision and drainage with adequate wound care are sufficient for a simple abscess; antimicrobial agents should be considered when extended local infection is suspected. Repeating blood cultures to rule out persistent bacteremia after 2–4 days of antibiotic treatment is suggested for all patients with MRSA bacteremia, and identifying and eradicating the possible infection focus are also warranted. The suggested dosage of vancomycin is 30–60 mg/kg/day in two or three divided doses for patients with normal renal function, and the target trough serum concentration for therapeutic drug monitoring is 15–20 μg/mL . Close monitoring of the vancomycin treatment response is suggested. Alternative therapeutic drugs should be considered, even in VSSA-related infections, if the infection focus is eradicated, and an adequate dose is prescribed, but the clinical response is inadequate . For isolates with a vancomycin MIC >2 μg/mL, antibiotics other than vancomycin, such as linezolid, daptomycin, tigecycline, and fusidate sodium, are suggested. For community-acquired MRSA infections, trimethoprim-sulfamethoxazole, tetracyclines, fluoroquinolones, and clindamycin are alternative treatment choices depending on susceptibility results. To prevent the spread of MRSA, both standard precautions and contact precautions are suggested, including cohort nursing and frequent cleaning and disinfection of patient care equipment, instruments, devices, and the environment ,. The suggested screening sites for MRSA colonization include the nares, wounds, tracheostomy, sputum, invasive catheter sites, axilla, perineum, groin, and throat. Patients with nasal carriage are prone to S. aureus-related infections . Universal decolonization (intranasal mupirocin ointment 2% and 2% chlorhexidine-impregnated cloths) was more effective in decreasing MRSA-related infections than target decolonization in one study . Adequate antimicrobial stewardship is required because inappropriate antibiotic consumption is one of the most important etiologies of emerging resistance , and there is potential collateral damage between different antibiotics, such as fluoroquinolones and MRSA, and third-generation cephalosporins and VRE ,. Various molecular typing methods could help to elucidate the epidemiology of MRSA and its evolution ,,. Multilocus sequence typing (MLST) is suitable for determining macro-variations or long-term revolution on a large scale, but pulsed-field gel electrophoresis (PFGE) and even whole-genome sequencing are used for investigating micro-variations or short-term revolution on a smaller scale ,. Another common method, spa typing, based on the variable number of tandem repeats in the gene of protein A (spa), has a discriminatory power between PFGE and MLST ,. In Taiwan, the most common MLST-spa types of SCCmec types II, III, and IV MRSA isolates were ST5-t002 (USA100, New York/Japan clone), ST239-t037 (Brazilian/Hungarian clone), and ST59-t437, respectively. For SCCmec type V MRSA isolates, the most common MLST-spa types were ST59-t437 and ST45-t1081 ,,,,. S. aureus is a versatile pathogen which could lead to various diseases and evolution of rapid resistance under the selection pressure of various antibiotics. With the emerging reduced susceptibility of S. aureus to vancomycin (hVISA, VISA, and VRSA), vancomycin is no longer the first choice or surefire antimicrobial agent for treatment of infectious diseases caused by MRSA . Both careful antimicrobial agent selection and infection control interventions are all essential in treating patients with MRSA infections, especially for life-threatening cases. If a reduced vancomycin-susceptibility MRSA strain is suspected or there is a poor treatment response to vancomycin, alternative antibiotics should be considered. However, S. aureus strains nonsusceptible to daptomycin or resistant to linezolid and tigecycline have been reported ,,. The battle between human beings and microorganisms is never ending. Under selection pressure of with continuing antimicrobial agent consumption, medical personnel should anticipate the emergence of various resistant pathogens, such as “ESKAPE,”  where the “S” in the abbreviation stands for S. aureus. In the face of these multidrug-resistant pathogens, preventing the spread of resistant microorganisms and their resistance determinant genes and adequate antibiotics stewardship to prevent unnecessary selection pressures are inevitable medical issues . Lowy FD. Staphylococcus aureus infections. N Engl J Med 1998;339:520-32. Centers for Disease Controls, ROC (Taiwan). Nosocomial Infections Surveillance System. Available from: https://www.cdc.gov.tw/english/info.aspx?treeid=00ED75D6C887BB27&nowtreeid=F0131176AA46D5DB&tid=1A8C498AF5F8AF5D. Chambers HF, Deleo FR. Waves of resistance: Staphylococcus aureus in the antibiotic era. Nat Rev Microbiol 2009;7:629-41. Ho CM, Li CY, Ho MW, Lin CY, Liu SH, Lu JJ, et al. High rate of qacA- and qacB-positive methicillin-resistant Staphylococcus aureus isolates from chlorhexidine-impregnated catheter-related bloodstream infections. Antimicrob Agents Chemother 2012;56:5693-7. Chambers HF. The changing epidemiology of Staphylococcus aureus? Emerg Infect Dis 2001;7:178-82. Katayama Y, Zhang HZ, Hong D, Chambers HF. Jumping the barrier to beta-lactam resistance in Staphylococcus aureus. J Bacteriol 2003;185:5465-72. Clinical and Laboratory Standards Institute (CLSI). Performance standards for antimicrobial susceptibility testing. CLSI Document M100. 27th ed. Wayne (PA): CLSI; 2017.
International Working Group on the Classification of Staphylococcal Cassette Chromosome Elements (IWG-SCC). Classification of staphylococcal cassette chromosome mec (SCCmec): Guidelines for reporting novel SCCmec elements. Antimicrob Agents Chemother 2009;53:4961-7. Liu J, Chen D, Peters BM, Li L, Li B, Xu Z, et al. Staphylococcal chromosomal cassettes mec (SCCmec): A mobile genetic element in methicillin-resistant Staphylococcus aureus. Microb Pathog 2016;101:56-67. Paterson GK, Harrison EM, Holmes MA. The emergence of mecC methicillin-resistant Staphylococcus aureus. Trends Microbiol 2014;22:42-7. Pichon B, Hill R, Laurent F, Larsen AR, Skov RL, Holmes M, et al. Development of a real-time quadruplex PCR assay for simultaneous detection of nuc, Panton-Valentine Leucocidin (PVL), mecA and homologue mecALGA251. J Antimicrob Chemother 2012;67:2338-41. Hiramatsu K, Cui L, Kuroda M, Ito T. The emergence and evolution of methicillin-resistant Staphylococcus aureus. Trends Microbiol 2001;9:486-93. Chen CJ, Huang YC. New epidemiology of Staphylococcus aureus infection in Asia. Clin Microbiol Infect 2014;20:605-23. Wang JL, Wang JT, Chen SY, Chen YC, Chang SC. Distribution of staphylococcal cassette chromosome mec types and correlation with comorbidity and infection type in patients with MRSA bacteremia. PLoS One 2010;5:e9489. Ho CM, Ho MW, Lee CY, Tien N, Lu JJ. Clonal spreading of methicillin-resistant SCCmec Staphylococcus aureus with specific spa and dru types in central Taiwan. Eur J Clin Microbiol Infect Dis 2012;31:499-504. Centers for Disease Control and Prevention (CDC). Four pediatric deaths from community-acquired methicillin-resistant Staphylococcus aureus — Minnesota and North Dakota, 1997-1999. MMWR Morb Mortal Wkly Rep 1999;48:707-10. Zetola N, Francis JS, Nuermberger EL, Bishai WR. Community-acquired meticillin-resistant Staphylococcus aureus: An emerging threat. Lancet Infect Dis 2005;5:275-86. Otter JA, French GL. Nosocomial transmission of community-associated methicillin-resistant Staphylococcus aureus: An emerging threat. Lancet Infect Dis 2006;6:753-5. Reynolds PE. Structure, biochemistry and mechanism of action of glycopeptide antibiotics. Eur J Clin Microbiol Infect Dis 1989;8:943-50. Kirst HA, Thompson DG, Nicas TI. Historical yearly usage of vancomycin. Antimicrob Agents Chemother 1998;42:1303-4. Hiramatsu K, Hanaki H, Ino T, Yabuta K, Oguri T, Tenover FC, et al. Methicillin-resistant Staphylococcus aureus clinical strain with reduced vancomycin susceptibility. J Antimicrob Chemother 1997;40:135-6. Wang G, Hindler JF, Ward KW, Bruckner DA. Increased vancomycin MICs for Staphylococcus aureus clinical isolates from a university hospital during a 5-year period. J Clin Microbiol 2006;44:3883-6. Wang JL, Wang JT, Sheng WH, Chen YC, Chang SC. Nosocomial Methicillin-Resistant Staphylococcus aureus (MRSA) bacteremia in Taiwan: Mortality analyses and the impact of vancomycin, MIC = 2 mg/L, by the broth microdilution method. BMC Infect Dis 2010;10:159. Holmes NE, Turnidge JD, Munckhof WJ, Robinson JO, Korman TM, O'Sullivan MV, et al. Antibiotic choice may not explain poorer outcomes in patients with Staphylococcus aureus bacteremia and high vancomycin minimum inhibitory concentrations. J Infect Dis 2011;204:340-7. Appelbaum PC. MRSA – The tip of the iceberg. Clin Microbiol Infect 2006;12(Suppl 2):3-10. Tenover FC, Moellering RC Jr. 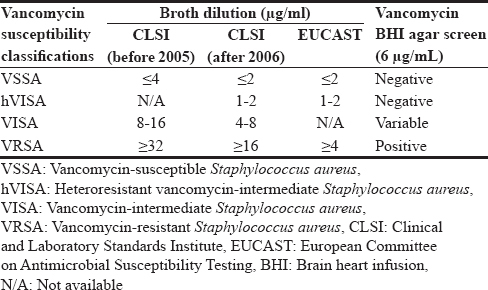 The rationale for revising the clinical and laboratory standards institute vancomycin minimal inhibitory concentration interpretive criteria for Staphylococcus aureus. Clin Infect Dis 2007;44:1208-15. Sakoulas G, Moellering RC Jr. Increasing antibiotic resistance among methicillin-resistant Staphylococcus aureus strains. Clin Infect Dis 2008;46(Suppl 5):S360-7. Howden BP, Davies JK, Johnson PD, Stinear TP, Grayson ML. Reduced vancomycin susceptibility in Staphylococcus aureus, including vancomycin-intermediate and heterogeneous vancomycin-intermediate strains: Resistance mechanisms, laboratory detection, and clinical implications. Clin Microbiol Rev 2010;23:99-139. Tenover FC, Biddle JW, Lancaster MV. Increasing resistance to vancomycin and other glycopeptides in Staphylococcus aureus. Emerg Infect Dis 2001;7:327-32. Clinical and Laboratory Standards Institute (CLSI). Methods for dilution antimicrobial susceptibility tests for bacteria that grow aerobically, approved standard. CLSI Document M07-A9. Wayne (PA): CLSI; 2012. Chang S, Sievert DM, Hageman JC, Boulton ML, Tenover FC, Downes FP, et al. Infection with vancomycin-resistant Staphylococcus aureus containing the vanA resistance gene. N Engl J Med 2003;348:1342-7. Centers for Disease Control and Prevention (CDC). Staphylococcus aureus resistant to vancomycin – United States, 2002. MMWR Morb Mortal Wkly Rep 2002;51:565-7. Howden BP, Smith DJ, Mansell A, Johnson PD, Ward PB, Stinear TP, et al. Different bacterial gene expression patterns and attenuated host immune responses are associated with the evolution of low-level vancomycin resistance during persistent methicillin-resistant Staphylococcus aureus bacteraemia. BMC Microbiol 2008;8:39. Hanaki H, Kuwahara-Arai K, Boyle-Vavra S, Daum RS, Labischinski H, Hiramatsu K, et al. Activated cell-wall synthesis is associated with vancomycin resistance in methicillin-resistant Staphylococcus aureus clinical strains Mu3 and Mu50. J Antimicrob Chemother 1998;42:199-209. McAleese F, Wu SW, Sieradzki K, Dunman P, Murphy E, Projan S, et al. Overexpression of genes of the cell wall stimulon in clinical isolates of Staphylococcus aureus exhibiting vancomycin-intermediate-S. aureus-type resistance to vancomycin. J Bacteriol 2006;188:1120-33. Smith TL, Pearson ML, Wilcox KR, Cruz C, Lancaster MV, Robinson-Dunn B, et al. Emergence of vancomycin resistance in Staphylococcus aureus. Glycopeptide-Intermediate Staphylococcus aureus Working Group. N Engl J Med 1999;340:493-501. Cui L, Ma X, Sato K, Okuma K, Tenover FC, Mamizuka EM, et al. Cell wall thickening is a common feature of vancomycin resistance in Staphylococcus aureus. J Clin Microbiol 2003;41:5-14. Liu C, Chambers HF. Staphylococcus aureus with heterogeneous resistance to vancomycin: Epidemiology, clinical significance, and critical assessment of diagnostic methods. Antimicrob Agents Chemother 2003;47:3040-5. Wootton M, Howe RA, Hillman R, Walsh TR, Bennett PM, MacGowan AP, et al. A modified population analysis profile (PAP) method to detect hetero-resistance to vancomycin in Staphylococcus aureus in a UK hospital. J Antimicrob Chemother 2001;47:399-403. Charles PG, Ward PB, Johnson PD, Howden BP, Grayson ML. Clinical features associated with bacteremia due to heterogeneous vancomycin-intermediate Staphylococcus aureus. Clin Infect Dis 2004;38:448-51.
van Hal SJ, Paterson DL. Systematic review and meta-analysis of the significance of heterogeneous vancomycin-intermediate Staphylococcus aureus isolates. Antimicrob Agents Chemother 2011;55:405-10. Hsueh PR, Liu CY, Luh KT. Current status of antimicrobial resistance in Taiwan. Emerg Infect Dis 2002;8:132-7. Ho CM, Hsueh PR, Liu CY, Lee SY, Chiueh TS, Shyr JM, et al. Prevalence and accessory gene regulator (agr) analysis of vancomycin-intermediate Staphylococcus aureus among methicillin-resistant isolates in Taiwan – SMART program, 2003. Eur J Clin Microbiol Infect Dis 2010;29:383-9. Lin SY, Chen TC, Chen FJ, Chen YH, Lin YI, Siu LK, et al. Molecular epidemiology and clinical characteristics of hetero-resistant vancomycin intermediate Staphylococcus aureus bacteremia in a Taiwan medical center. J Microbiol Immunol Infect 2012;45:435-41. Huang SH, Chen YC, Chuang YC, Chiu SK, Fung CP, Lu PL, et al. Prevalence of vancomycin-intermediate Staphylococcus aureus (VISA) and heterogeneous VISA among methicillin-resistant S. aureus with high vancomycin minimal inhibitory concentrations in Taiwan: A multicenter surveillance study, 2012-2013. J Microbiol Immunol Infect 2016;49:701-7. Liu C, Bayer A, Cosgrove SE, Daum RS, Fridkin SK, Gorwitz RJ, et al. Clinical practice guidelines by the infectious diseases society of America for the treatment of methicillin-resistant Staphylococcus aureus infections in adults and children. Clin Infect Dis 2011;52:e18-55. Chen YS. Guidelines for the treatment of methicillin-resistant Staphylococcus aureus infections in Taiwan. J Microbiol Immunol Infect 2013;46:147-50. Rybak M, Lomaestro B, Rotschafer JC, Moellering R Jr., Craig W, Billeter M, et al. Therapeutic monitoring of vancomycin in adult patients: A consensus review of the American Society of Health-System Pharmacists, the Infectious Diseases Society of America, and the Society of Infectious Diseases Pharmacists. Am J Health Syst Pharm 2009;66:82-98. Hageman JC, Liedtke LA, Sunenshine RH, Strausbaugh LJ, McDonald LC, Tenover FC, et al. Management of persistent bacteremia caused by methicillin-resistant Staphylococcus aureus: A survey of infectious diseases consultants. Clin Infect Dis 2006;43:e42-5. Siegel JD, Rhinehart E, Jackson M, Chiarello L; Health Care Infection Control Practices Advisory Committee. 2007 guideline for isolation precautions: Preventing transmission of infectious agents in health care settings. Am J Infect Control 2007;35:S65-164. Revised guidelines for the control of methicillin-resistant Staphylococcus aureus infection in hospitals. British Society for Antimicrobial Chemotherapy, Hospital Infection Society and the Infection Control Nurses Association. J Hosp Infect 1998;39:253-90. Luzar MA, Coles GA, Faller B, Slingeneyer A, Dah GD, Briat C, et al. Staphylococcus aureus nasal carriage and infection in patients on continuous ambulatory peritoneal dialysis. N Engl J Med 1990;322:505-9. Huang SS, Septimus E, Kleinman K, Moody J, Hickok J, Avery TR, et al. Targeted versus universal decolonization to prevent ICU infection. N Engl J Med 2013;368:2255-65. Hsueh PR, Chen WH, Teng LJ, Luh KT. Nosocomial infections due to methicillin-resistant Staphylococcus aureus and vancomycin-resistant enterococci at a university hospital in Taiwan from 1991 to 2003: Resistance trends, antibiotic usage and in vitro activities of newer antimicrobial agents. Int J Antimicrob Agents 2005;26:43-9. Paterson DL. “Collateral damage” from cephalosporin or quinolone antibiotic therapy. Clin Infect Dis 2004;38(Suppl 4):S341-5. Barlam TF, Cosgrove SE, Abbo LM, MacDougall C, Schuetz AN, Septimus EJ, et al. Implementing an antibiotic stewardship program: Guidelines by the Infectious Diseases Society of America and the Society for Healthcare Epidemiology of America. Clin Infect Dis 2016;62:e51-77. Deurenberg RH, Stobberingh EE. The evolution of Staphylococcus aureus. Infect Genet Evol 2008;8:747-63. Boucher HW, Corey GR. Epidemiology of methicillin-resistant Staphylococcus aureus. Clin Infect Dis 2008;46(Suppl 5):S344-9. Enright MC, Robinson DA, Randle G, Feil EJ, Grundmann H, Spratt BG, et al. The evolutionary history of methicillin-resistant Staphylococcus aureus (MRSA). Proc Natl Acad Sci U S A 2002;99:7687-92. Price JR, Golubchik T, Cole K, Wilson DJ, Crook DW, Thwaites GE, et al. Whole-genome sequencing shows that patient-to-patient transmission rarely accounts for acquisition of Staphylococcus aureus in an Intensive Care Unit. Clin Infect Dis 2014;58:609-18. Koreen L, Ramaswamy SV, Graviss EA, Naidich S, Musser JM, Kreiswirth BN, et al. Spa typing method for discriminating among Staphylococcus aureus isolates: Implications for use of a single marker to detect genetic micro- and macrovariation. J Clin Microbiol 2004;42:792-9. Frénay HM, Bunschoten AE, Schouls LM, van Leeuwen WJ, Vandenbroucke-Grauls CM, Verhoef J, et al. Molecular typing of methicillin-resistant Staphylococcus aureus on the basis of protein A gene polymorphism. Eur J Clin Microbiol Infect Dis 1996;15:60-4. Ho CM, Ho MW, Li CY, Lu JJ. Fine typing of methicillin-resistant Staphylococcus aureus isolates using direct repeat unit and staphylococcal interspersed repeat unit typing methods. J Microbiol Immunol Infect 2015;48:370-5. Ho CM, Lin CY, Ho MW, Lin HC, Peng CT, Lu JJ, et al. Concomitant genotyping revealed diverse spreading between methicillin-resistant Staphylococcus aureus and methicillin-susceptible Staphylococcus aureus in central Taiwan. J Microbiol Immunol Infect 2016;49:363-70. Ho CM, Lin CY, Ho MW, Lin HC, Chen CJ, Lin LC, et al. Methicillin-resistant Staphylococcus aureus isolates with SCCmec type V and spa types t437 or t1081 associated to discordant susceptibility results between oxacillin and cefoxitin, central Taiwan. Diagn Microbiol Infect Dis 2016;86:405-11. Mohr JF, Murray BE. Point: Vancomycin is not obsolete for the treatment of infection caused by methicillin-resistant Staphylococcus aureus. Clin Infect Dis 2007;44:1536-42. McAleese F, Petersen P, Ruzin A, Dunman PM, Murphy E, Projan SJ, et al. A novel MATE family efflux pump contributes to the reduced susceptibility of laboratory-derived Staphylococcus aureus mutants to tigecycline. Antimicrob Agents Chemother 2005;49:1865-71. Meka VG, Gold HS. Antimicrobial resistance to linezolid. Clin Infect Dis 2004;39:1010-5. Mwangi MM, Wu SW, Zhou Y, Sieradzki K, de Lencastre H, Richardson P, et al. Tracking the in vivo evolution of multidrug resistance in Staphylococcus aureus by whole-genome sequencing. Proc Natl Acad Sci U S A 2007;104:9451-6. Boucher HW, Talbot GH, Bradley JS, Edwards JE, Gilbert D, Rice LB, et al. Bad bugs, no drugs: No ESKAPE! An update from the Infectious Diseases Society of America. Clin Infect Dis 2009;48:1-2. Fridkin SK. Vancomycin-intermediate and -resistant Staphylococcus aureus: What the infectious disease specialist needs to know. Clin Infect Dis 2001;32:108-15.